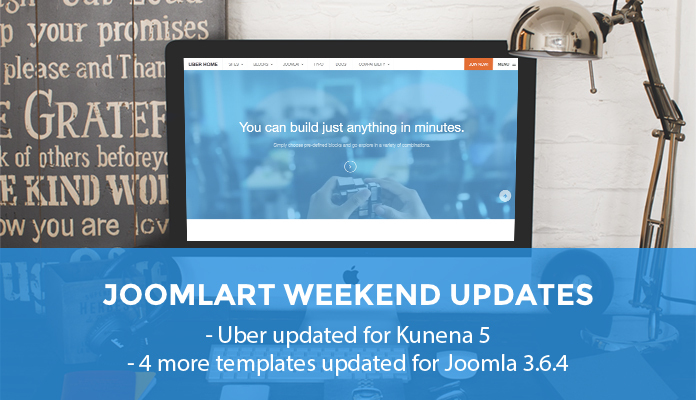 This weekend, we are releasing T3 Framework, 5 more Joomla templates and JA Quick Conctact plugin for Joomla 3.7.2. 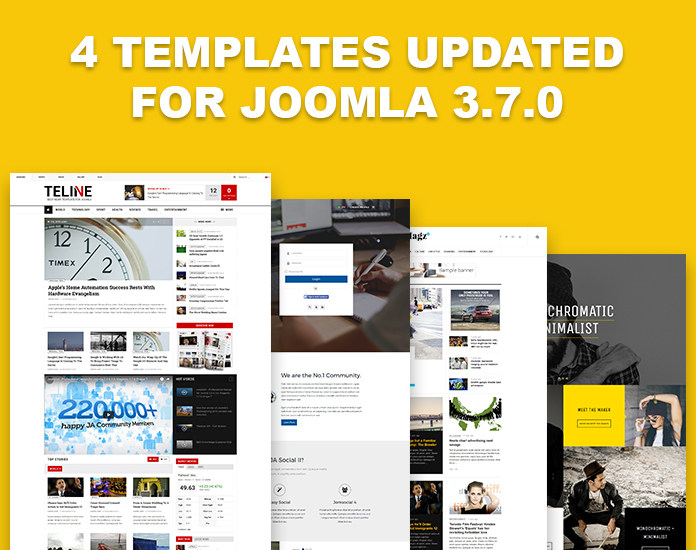 Few days back we released 12 Joomla templates for Joomla 3.7. Please check the changelog below for details. 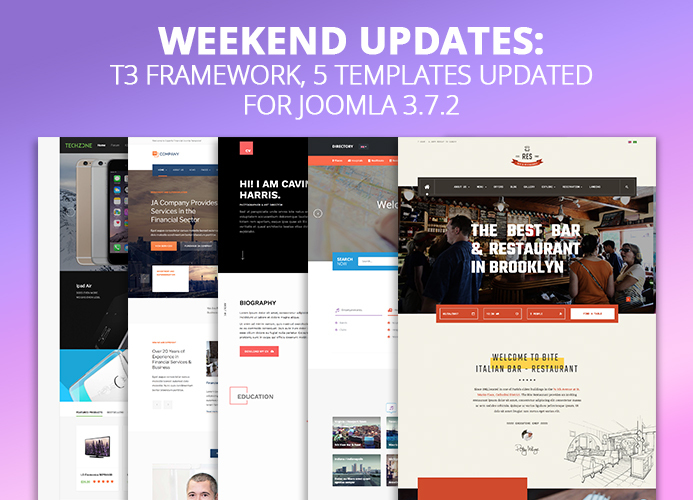 Last week, we released T3 Framework and 4 Joomla templates for Joomla 3.7.0. 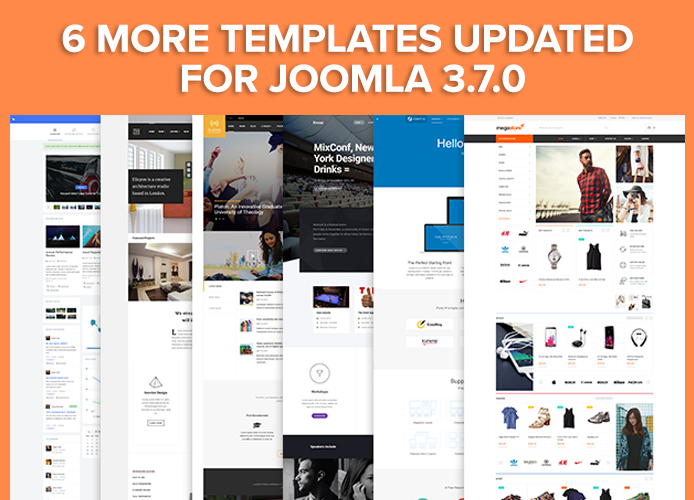 Today we released 6 more Joomla templates for Joomla 3.7.0. Please check the changelog below for details. 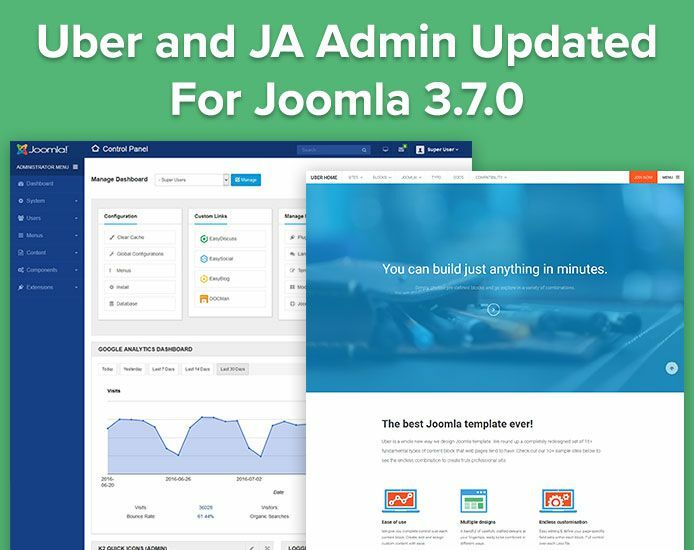 Last week, we released T3 Framework and 4 Joomla templates for Joomla 3.7.0 and today we released 2 more Joomla templates for Joomla 3.7.0: Uber and JA Admin. Please check the changelog below for details. This week, we have updated 4 Joomla templates for Joomla 3.7.0, including: JA Social II, JA Teline V, JA Brickstore and JA Magz II. This also includes bug fixes. Please check the changelog below for details. 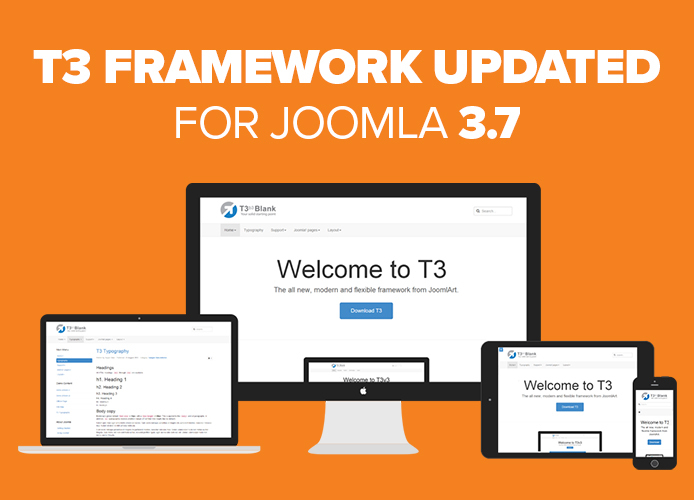 We have updated our T3 framework for Joomla 3.7.0 version. Please take backup before updating to the latest version. Expect more templates updates to be available next week. Joomla 3.7.0 is a major version update and brings in really nice features. Joomla! marching in the right direction with these updates. 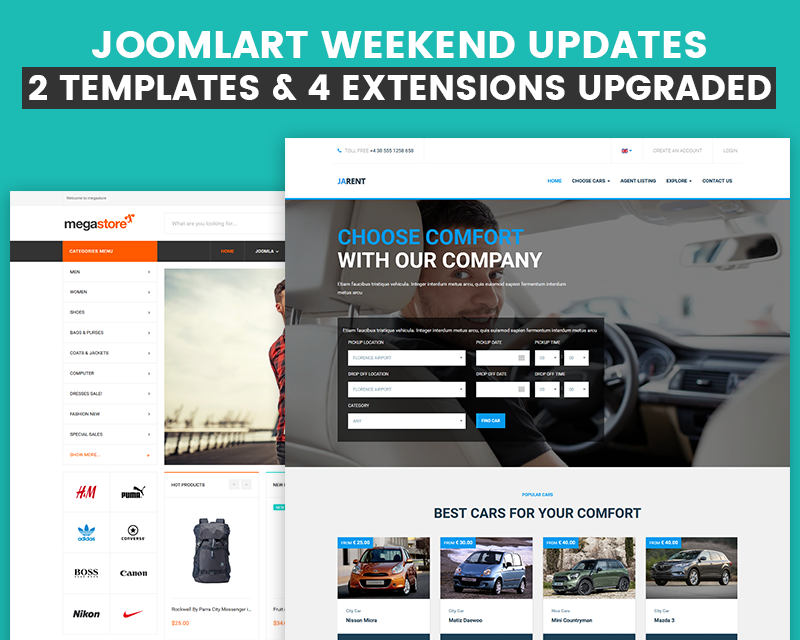 This week, JoomlArt team have updated JA Rent template, JA Megastore template, JA S3 Amazon component, JA Social Feed plugin, JA Google Analytics module and JA Hotspot module. Please check the changelog below for details. 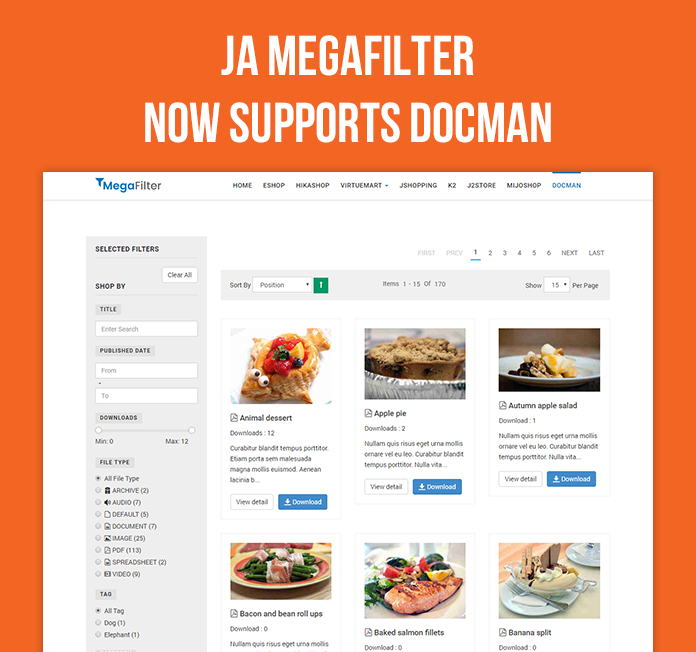 Today, we released new version for JA Megafilter - advanced Joomla filter component with major update - DOCman Support. You can now create stunning search and filter page for DOCman component. 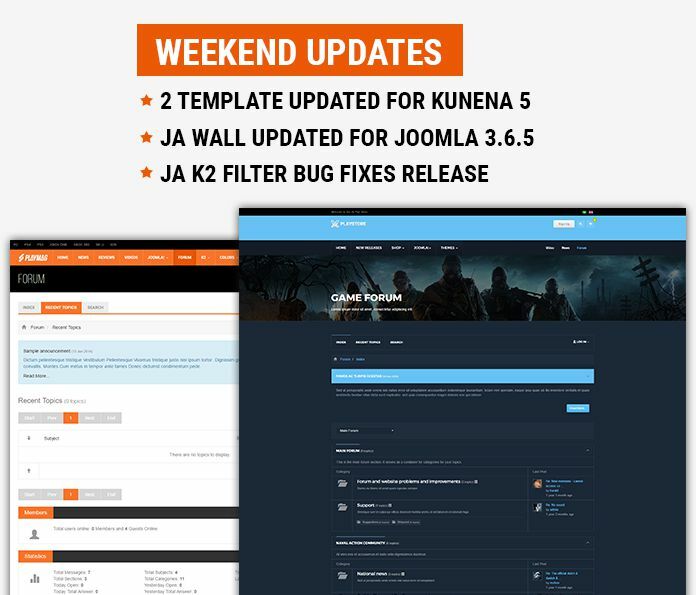 Apart from JA Joomla Page Builder RC release, this week, we have also updated JA Wall template and JA Playmag, JA Playstore for Kunena 5 and bug fixes. JA K2 filter and search is also updated. Please check the changelog below for details. 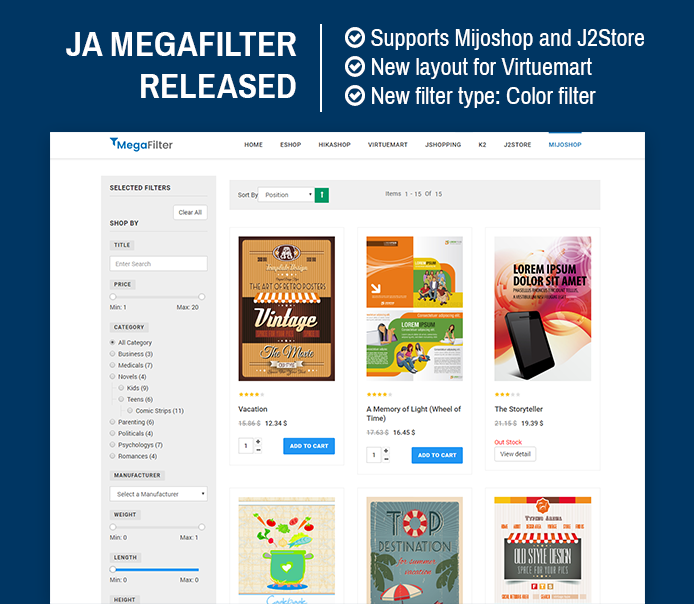 JA Megafilter for Joomla component just got an update and it now supports MijoShop and J2Store Joomla components. A new layout for Virtuemart has also been added along with other improvements and bug fixes. 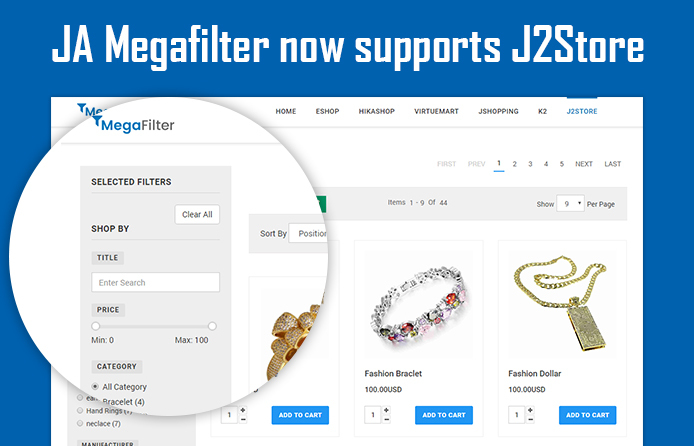 Joomla search filter component - JA Joomla Megafilter now supports J2 Store component - eCommerce Joomla extension. 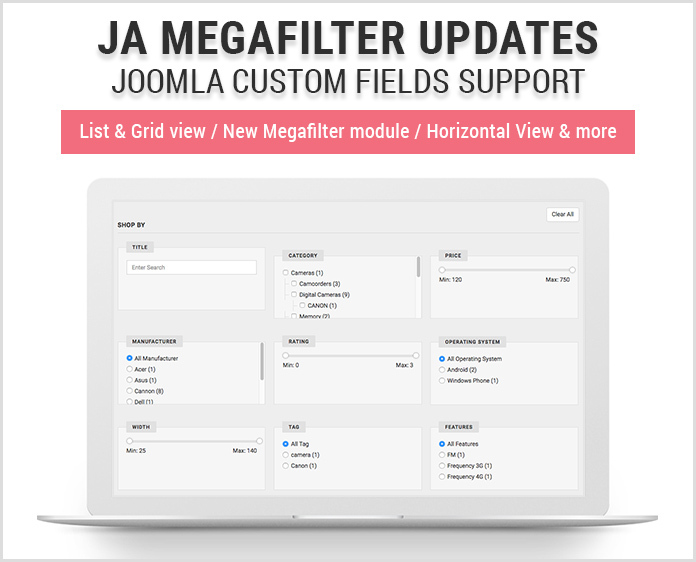 All one needs to do is install JA Joomla MegaFilter and choose J2store in settings. 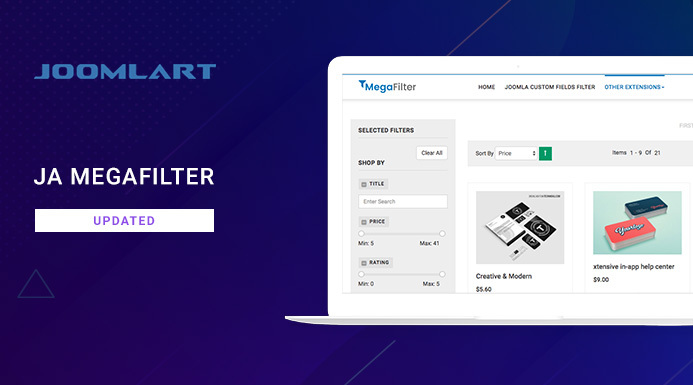 JA Megafilter is advanced Search and Filter Joomla extension for popular Joomla extensions such as : K2, Virtuemart, Hikashop, Eshop, JoomShopping and J2 Store. We love to keep our Joomla templates updated and this week we have updated our multi purpose Joomla Template Uber for Kunena 5 latest version as well as JA Cagox, Charity, Hotel and our popular free Joomla template Purity III were also updated for latest Joomla version and routine bug fixes.